Spring has traditionally been heralded by wearing a new or favorite hat. Head coverings are probably as old as humans — cave dwellers would have covered their heads with animal pelts for warmth. Hats fall in and out of fashion but, with increasing health risks, have become a very important accessory, especially in warmer climates. The English term “millinery” was first used in the fifteenth century and derived from the words “Millayne bonnets” which were hats made in Milan. Anything that wasn’t a hood was referred to as a bonnet in French and a cap in English. Hats have evolved into a myriad of shapes and styles and were often used to measure a person’s wealth or status. Milliners were considered as important as the haute couture designers of the Edwardian Era and women of means were encouraged to hone their millinery skills. Throughout the centuries either the hat or hair has dictated the style of the other. High, bouffant hairdos called for larger, extravagant hats while head-hugging cloches complemented the Bob cut of the Flapper era. Hats were worn on a daily basis through the late 1960s when they became nearly obsolete due to the more casual fashions of that time and later. With the resurgence of needle arts on all levels, accessories have become a fun way to ease back into the art of sewing. 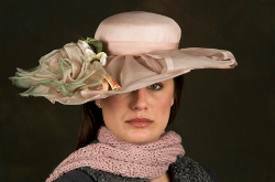 Patterns for casual caps, stylish hats and elegant bridal veils are accessible in most pattern catalogs. As you would consider your height and figure when deciding upon a garment silhouette, you must also choose the appropriate hat style to complement you hair, face and figure. The tall slender woman wears a medium sized, turned down brim or floppy hat better than one that is higher or has a turned-back brim. A round, full face calls for an irregular line to the hat or one that is cocked to one side. 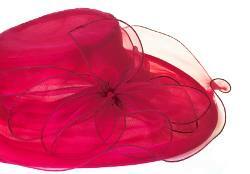 A moderate size hat with upturned brim is more complementary to round shoulders or poor posture. The illusion of height is created on smaller women with no brim and a pillbox-type design. Tall narrow hats will draw the eye away from a short stouter figure while a slanted brim and crown does the same for one who is stout but taller.